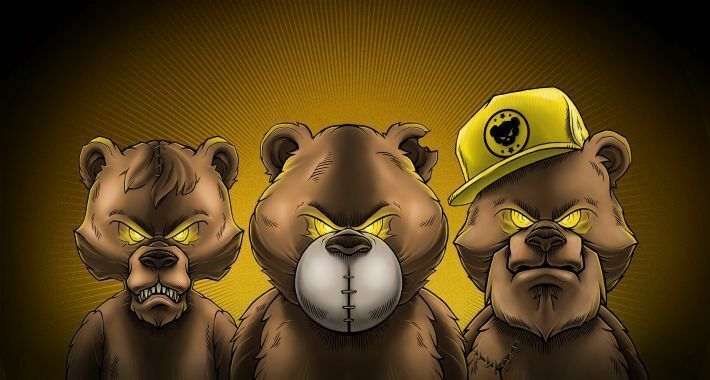 Teddy Killerz have reached the level of needing no introduction in drum & bass at this point, joining the likes of Noisia, Goldie, Pendulum and precious few others who have that distinction. Their hyperspeed jumpy beats, metallic techy synths and epic drops are instantly recognizable to neurofunk and jump up fans alike. Their latest EP venture out on Eatbrain called Hellblade, however, seems to be a zombie of a different color. Teddy Killerz and Eatbrain have matched up many times on releases. In fact, TK were among the first artists to release on the neuro label. It thus stands to reason that Teddy Killerz would want to hook up with Eatbrain on a release such as Hellblade. This particular EP has lots of dark and ominous undertones, overtones and even sound design that, to no one’s surprise, fit perfectly with the dark and ominous zombie vibes of Eatbrain. The title track from Hellblade starts out in what some might say is typical Teddy Killerz style, with a straight-on snare and layered background synths. The break before the first drop brings in some lovely teeth-crunching metallic sounds which seem like they’re spiraling down into the more ominous sub synths. Matching this downward spiral is what sounds like a literal bomb drop which contains an almost cartoonish-sounding whistle effect before the drop. This is also somewhat characteristic of TK as they like to bring in some funny elements to their tracks, but a literal bomb drop at the beat drop? Quite clever. Once the track gets going there are even more surprises to “Hellblade”, mostly in the form of the synth and sub synth syncopation. Despite the snares and beat going one way and being quite structured, the synths take on a completely separate structure of their own, both layering over and fitting into the gaps between the drums and bass track. This is a tricky technique in any genre of bass music and is usually seen in halftime due to the slower tempo being easier to work with. Creating this double beat structure at 174 BPM is probably something only TK and a handful of others can pull off. And if that weren’t enough, after the second break this tight, finely knit beat structure flips completely around to another different double grid which is almost the mirror image of the first one. Good luck mixing this one, DJs! As usual, Teddy Killerz have created a release which is very unusual with Hellblade and as usual fans can expect to hear probably all the tracks off this EP throughout the festival season. If the title track is anything to go by, said festivals will get an extra shot of energy and heavy vibes every time one of these beauties blasts out of the speaker stacks. Hellblade is out on a Beatport exclusive on Eatbrain Monday, April 2. It drops worldwide April 16. Check the Eatbrain website for details.